Bulb shaped glass impeller rotates from fixed position above liquid level around an indentation in the glass flask's base. 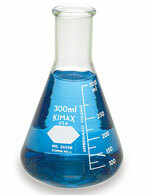 These Magna-Flex glass spinner flasks feature a bulb-shaped glass impeller inside the flasks that rotates from a fixed position above liquid level around an indentation in the base of the flask. 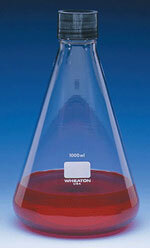 The glass flasks are intended for use primarily with microcarrier cultures. These flasks increase stirring efficiency and provide an even circulation throughout the flask while keeping the beads in suspension. All glass spinner flasks are proportioned to provide a head space ratio of at least 1:1. 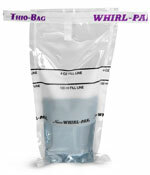 A removable stainless steel pin is included to immobilize the impeller during handling or decanting, which prevents damage to cells or microcarriers.